We’ve already touched on mayonnaise, but we also realized that mayo is so versatile and delicious that it’s worth revisiting and reiterating how simple it can be to prepare at home. Add to that the fact that healthy store-bought mayonnaise is not something that exists at the moment; all of them are prepared with oils that are very high in polyunsaturated fat. Making mayonnaise doesn’t have to turn into an endurance test of your whisking abilities, thanks to the help of common kitchen tools. Making mayonnaise by hand with only your arm, a bowl and a whisk can certainly empress a few and makes for less cleaning, but it can frankly be exhausting and very frustrating if the mayonnaise ends up breaking. Using either a blender, food processor or handheld immersion blender is the easiest way to whip up a perfect mayonnaise every time. We like to use an immersion blender with the whisk attachment, but any tool you have that’ll let you blend all the ingredients while you slowly pour in the oil will do. Note: This mayonnaise is prepared with raw egg yolks, so is to be avoided if the higher risk of contracting a food-borne illness is not a risk you’re ready to take. Definitely make sure to keep your homemade mayonnaise refrigerated. Mayonnaise is made primarily of oil, so choosing the right oil is of course very important. We like to use either only light olive oil or a combination of light olive oil with another oil like macadamia oil, avocado oil, melted lard or melted ghee. Mayonnaise is probably the only occasion where we’ll use light olive oil instead of an higher quality extra-virgin olive oil, which would taste too strong for a mayonnaise. It’s also important to use a greater amount of an oil that stay liquid even when placed in the refrigerator, to prevent your mayonnaise from becoming as hard as a rock. So for example, if using lard or ghee, a good proportion would be to use ¼ of the lard or ghee to ¾ of olive oil. 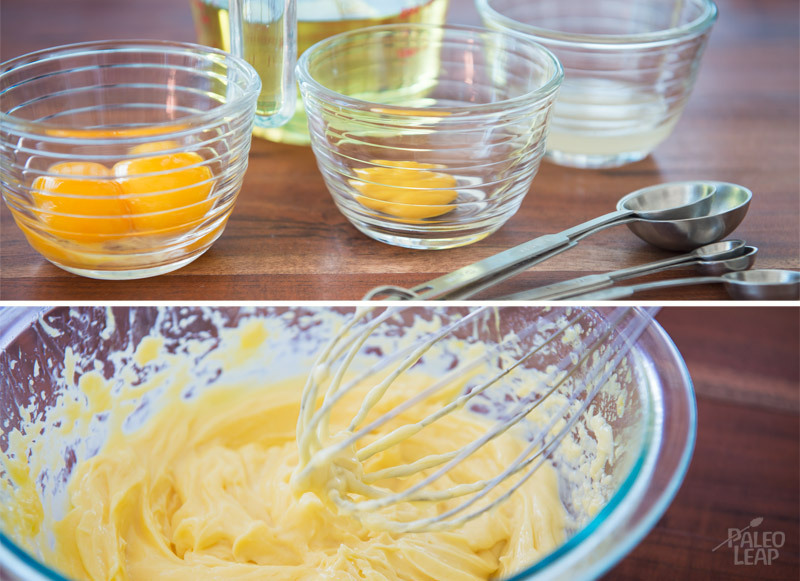 A mayonnaise becomes broken if the oil is incorporated too fast with the mixture of eggs and becomes liquid and lumpy. Fortunately though, fixing a broken mayonnaise is not as complicated as it may seem. Simply take out a new bowl, add in an egg yolk and 1 tsp of fresh lemon juice and then slowly whisk or blend in your broken mayonnaise. Place the egg yolks, 1 tsp of the lemon juice, the mustard and the pinch of salt in a bowl or in the bowl of your food processor or blender. Start whisking/blending everything together and then start slowly drizzling the oil in. Continue pouring in the oil slowly, but steadily. An emulsion will eventually start to form and you’ll be able to pour in the oil more quickly. Using a blender, immersion blender or food processor make it very easy, but if you decide to whisk it by hand you’ll have to whisk quite vigorously for the whole process to prevent the mayonnaise from separating. 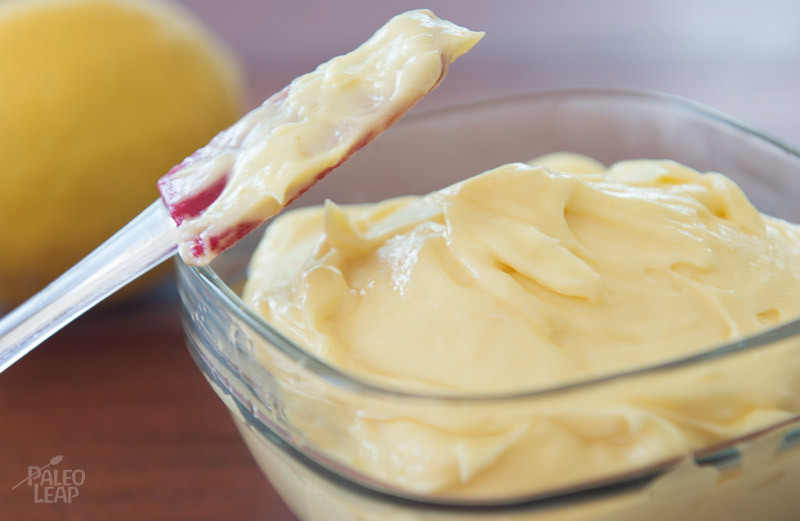 Your mayonnaise should be quite thick when all the oil is incorporated and you can then add the remaining lemon juice and blend it in with the mayonnaise. 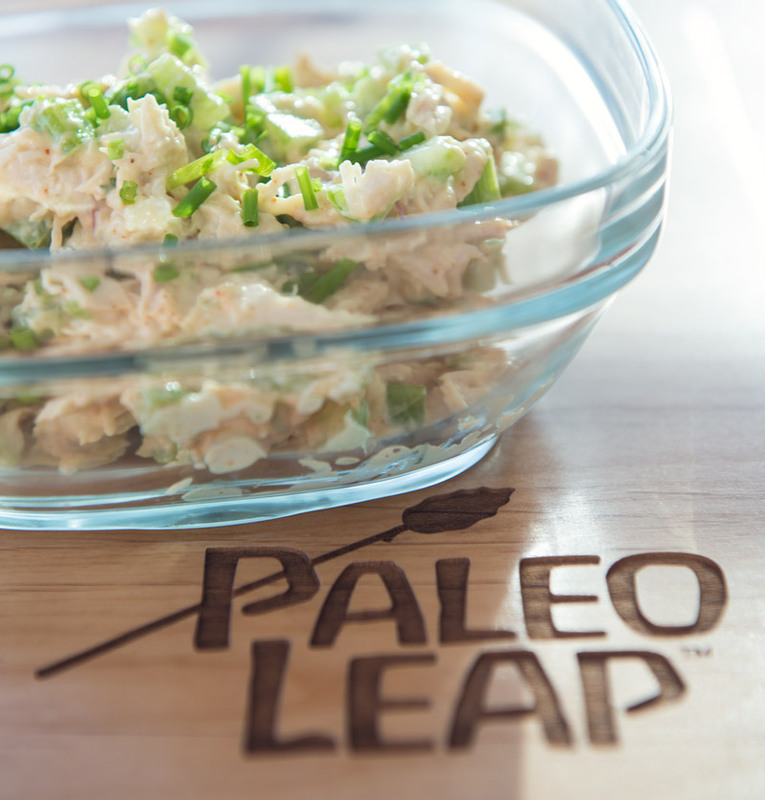 Enjoy and refrigerate the leftovers!